What the hell is going on at Borussia Dortmund? After six months of uncertainty under Thomas Tuchel, Borussia Dortmund fans surely had to be happy with the arrival of Ajax head coach, Peter Bosz following the German’s dismissal. Bosz had guided the Amsterdam club to the Europa League final, where they lost out to Manchester United while his attacking philosophy provided Dortmund fans with a sense of excitement heading into the 2017/18 season. Despite the departure of Ousmane Dembele to Barcelona, Dortmund recruited well with the arrivals of Omer Toprak, Mahmoud Dahoud, Maximillian Philipp and Andriy Yarmolenko: but ultimately, things have taken a turn for the worse at Borussia Dortmund. Firstly, let’s look at the positives. Although Borussia Dortmund’s season kicked off with a defeat against Bayern Munich in the DFL Supercup, it was their performance under Bosz that game that showcased plenty of positives. Christian Pulisic being one of them; the American opened the scoring after just 12 minutes after Dortmund won the ball back high up the pitch. BVB held a 2-1 lead until an own goal from Roman Burki two minutes from time resulted in penalties, of which Dortmund lost. However, their impressive performance that game carried over to their Bundesliga form, for the opening seven games at least. At the time, Borussia Dortmund were sitting pretty at the Bundesliga summit, a whole five points ahead of their league rivals, Bayern Munich. 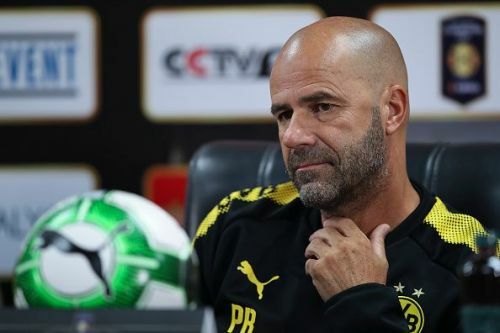 Bosz had an impressive start to his Bundesliga campaign, guiding the Westfalenstadion outfit to six wins and one draw, conceding just two and scoring 21 in the process. To score 14 goals against 1. FC Koln, Hamburger SV and Borussia Monchengladbach in just three games combined certainly should be commended and while they were impressive performances, it was their narrow win over Augsburg in the following game that started to show weaknesses. Pierre-Emerick Aubameyang had eight Bundesliga goals prior to their first Bundesliga defeat, coming at the hands of European challenger rivals, RB Leipzig. The Gabon international scored two against the Red Bull backed club but ultimately the performance as a team just wasn’t good enough. An early goal after four minutes offered plenty of positivity but finding themselves 1-3 down before the hour mark showcased plenty of defensive incapabilities. Greek defender Sokratis was shown a red just after the break while an error from Burki gifted RB a goal: a sign of things to come. Since that defeat against RB Leipzig, Borussia Dortmund have tasted victory just once: a 5-0 win against FC Magdeburg in the DFB Pokal, while the pressure on Bosz has certainly intensified. In nine games in all competitions (W1, D3, L5), Borussia Dortmund have gone from a real contender on all fronts to trailing Bayern Munich in the league by nine points, and we’re only in November. Following their 2-1 defeat against VfB Stuttgart on Friday night – their third loss on the trot – Bosz was reportedly given two matches to save his job: Tottenham Hotspur in the Champions League and fierce rivals, FC Schalke 04 in one of Europe’s most anticipated fixtures, the Revierderby. Unfortunately for Bosz, after taking the lead against Tottenham Hotspur on Tuesday night, they succumbed to a 1-2 defeat, meaning they can no longer qualify for the knockout stages of the Champions League, while their ability to qualify for the Europa League is hanging by a thread. For a club of Dortmund’s stature, they ought to be challenging at the highest level but unfortunately, they haven’t really done so since Jurgen Klopp was at the club, where he guided them to the 2013 Champions League final, losing out to a late goal by Arjen Robben for Bayern Munich. Drawn alongside Real Madrid, Tottenham and APOEL Nicosia, many had thought Bosz would at least be able to challenge for the next round but with two successive draws against APOEL, they don’t really deserve to reach the knockout phase. 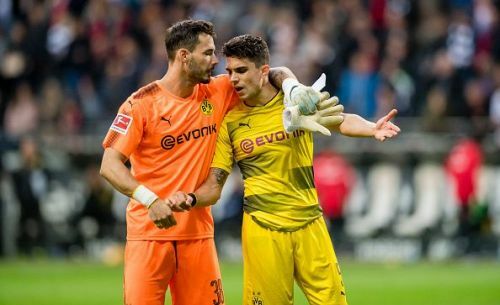 Granted, injuries haven’t helped Borussia Dortmund while questions surround the quality of Switzerland goalkeeper, Burki, who has come in for an astonishing amount of criticism. Dortmund’s No. 1 had been solid prior to Bosz’ arrival from Ajax but in both domestic and European football, Burki is susceptible to the odd mistake, which has cost Dortmund valuable points. So where do Dortmund go from here? While Bosz arguably has one game to save his BVB career against an in-form Schalke side, there are not many candidates out there who could potentially take over from the Dutchman. Given that Dortmund’s chief scout Sven Mislintat has departed for Arsenal, Thomas Tuchel could well return, but that’s extremely unlikely. Prior to choosing Bosz, Dortmund’s hierarchy had been interested in OGC Nice’s Lucien Favre, but no club wants to lose their coach during the season and so they would’ve to pay a hefty compensation fee. The only option for Dortmund at this stage realistically would be to keep Bosz until at least the winter break.